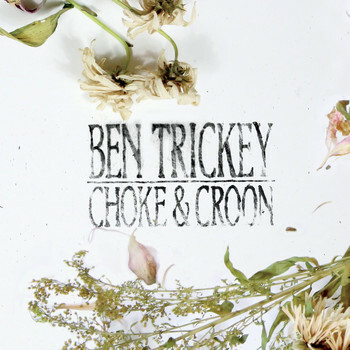 Three years was far too long to wait a new Ben Trickey album. His debut, Rising Waters, was one of my favorites of 2013 and continues to be a standby, even three years later. But maybe three years was the right amount of time; it goes without saying that Choke & Croon is meticulous in its execution. Trickey has side-stepped away from the distinctive, mournful Americana that defined his first album. Instead, it's probably more accurate to say that this collection of songs is informed by roots music. The songs are rife with guitar and fiddle, but feel more like set dressing than driving forces of the music. This is especially true in the six-minute epic "Monster," which brings Trickey's previous experience as an abstract installation artist to the forefront. The tension between the overwhelming music and Trickey's depictions of everyday disappointments makes me think of the ways we suppress our emotions -- which can threaten to overwhelm us -- in a desperate attempt to keep living life "normally," whatever that means. Trickey's music gives us a glimpse of the nearly impossible weight he carries on his shoulders, a weight that he hefts against all odds, reminding us that our burdens -- however heavy they may be at the moment -- can be shouldered as well.